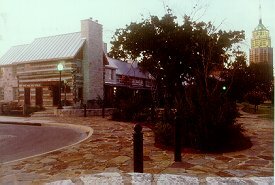 The Riverwalk Inn is comprised of five two-story log homes, (circa 1840), relocated from Tennessee and restored along the scenic San Antonio Riverwalk. Decorated in period antiques creating an ambience of "country elegance." "Rock till you drop" on our 90 foot porch lined with rocking chairs. Enjoy Aunt Martha's evening dessert and local storytellers that join us for our delicious breakfast buffet. Amenities include: river views, fireplaces, refrigerators, private baths, phones with voice mail, balconies, TV, conference room, fax, pc hookups. Texas hospitality with a Tennessee flavor awaits you at the Riverwalk Inn. Directions: from airport-Hwy. 37S to Durango/Alamodome, exit R on Durango, go to the fourth traffic light, turn right on Dwyer, take first right onto Old Gullbeau. Riverwalk Inn Bed and Breakfast is at the end on the left.